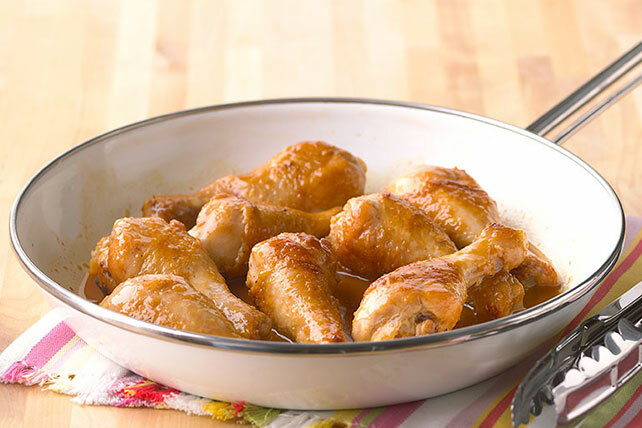 Looking for a simple one-pan chicken dish with a sweet and sticky glaze? This weeknight-quick Asian-Glazed Skillet Chicken fits the bill! Cook chicken in large nonstick skillet on medium-high heat 5 min. or until evenly browned, turning occasionally. Drain. Stir in remaining ingredients. Bring to boil; cover. Simmer on medium heat 10 to 12 min. or until chicken is done (165ºF), stirring occasionally. Serve with a side of rice and your favorite steamed vegetable to round out the meal. Garnish with 2 chopped green onions just before serving.